PVC-vinyl fences have enjoyed booming demand over the last decade and are some of the most popular fencing choices with good reason. They are virtually maintenance free, come with a limited lifetime warranty and are a green product that is recyclable. PVC can offer complete privacy but is also available in multiple styles and colors. Although there is flex to PVC, it has five times the tensile strength of wood. Our manufacturer uses only pure raw materials made in the USA in making the products. 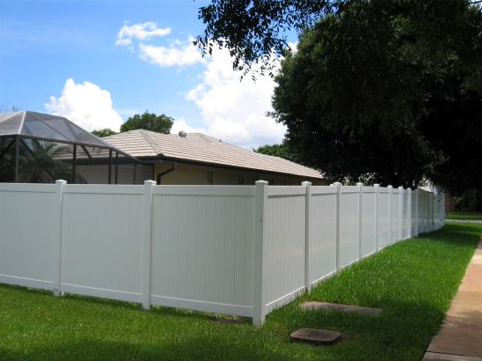 By far the most popular style is the 6′ high white total privacy fence called Tongue and Groove. It was created to be the privacy fence that would stay looking the same for many years and require no maintenance. Other available styles include lattice and stake top tongue and groove, PVC vertical shadow box, picket fence and horse rail fencing. All styles are available in a tan color and a darker tan called Khaki. Colors can also be mixed within one fence such as tan framing with white pickets. Grained and textured pickets are also available. Ready to learn more? 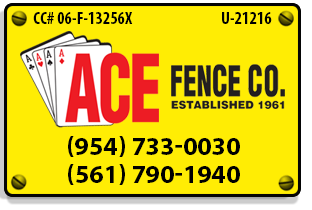 Click here to request a FREE Quote on PVC-Vinyl Fences!